The Premier League has appealed to fans to be “positive and respectful” following recent allegations of racism and abuse in football. 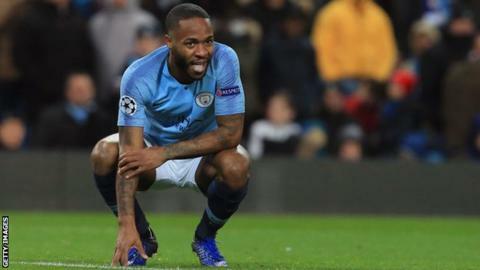 Chelsea are investigating alleged racist abuse aimed at Manchester City forward Raheem Sterling last weekend. The club has also condemned alleged anti-semitic chanting in the Europa League tie in Hungary on Thursday. The league says while the majority of fans generate an “exciting” atmosphere, a minority have “behaved unacceptably”. “Some brilliant football has been played this Premier League season and the vast majority of fans have generated exciting and passionate atmospheres in stadiums,” a Premier League statement said on Friday. “As we head into the festive season, with matches coming thick and fast, we ask all supporters to get behind their teams in passionate, positive and respectful ways. Chelsea responded to offensive songs about Tottenham fans sung during the Blues’ 2-2 draw with MOL Vidi in Budapest by saying it “shamed the club”. “Anti-Semitism and any kind of racial or religious hatred is abhorrent to this club and the overwhelming majority of our fans,” a spokesman said. Former Chelsea boss Claudio Ranieri praised his old club for being proactive. “I think Chelsea made the right statement,” the Italian, who is now in charge at Fulham, said on Friday. Everton manager Marco Silva also called for respect from fans. “For me, you have to be all involved in this situation and to respect our opponents, to respect ourselves and to look to the football to enjoy, like a party. Reality Check: Is football racism rising? Meanwhile, Cardiff manager Neil Warnock wants action from government to try to tackle racism in football. “I’d love to see the government appoint a mobile unit to go to certain games and sort them out,” Warnock said in his Friday news conference.